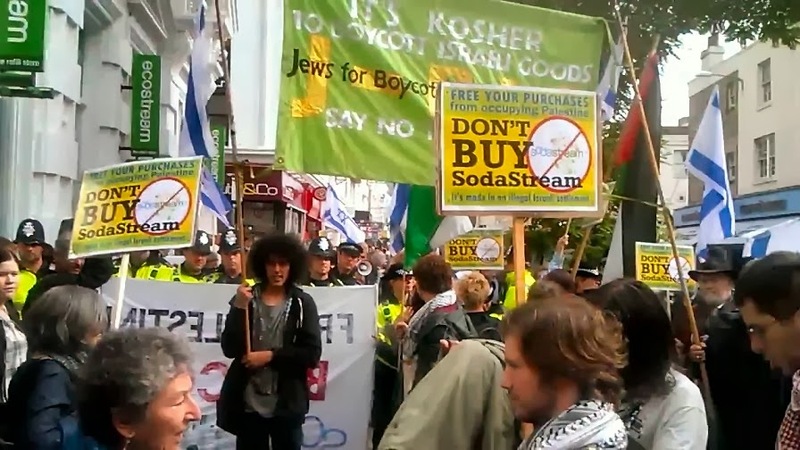 J-BIG is supporting the call from Brighton & Hove PSC to mark a year of protests to expose the Israeli-owned Ecostream shop. 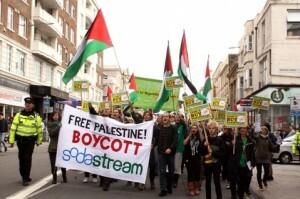 It poses as an eco-friendly enterprise but markets Sodastream products manufactured in Male Adumim. This is one among many illegal settlements which pollute Palestinian land and deprive Palestinians of access to water. See full details of the nationwide Day of Action on Saturday here. We will be taking the J-BIG banner to Brighton for a special demonstration starting at The Clocktower on Saturday at 12 noon. Please join us if you can. The regular demonstrations have become quite dramatic at times because of particularly nasty Zionist counter-protests. Our Jewish friend Terry Yason, who will be reading out messages of support on the 28th, has been forced to take legal action against a Christian Zionist who attacked him, calling him a Kapo and a fake Jew! The Brighton Argus newspaper has been backing a Zionist campaign to brand the pro-Palestinian activists as antisemites. We are particularly grateful to Miriam Margolyes and Alexei Sayle for providing the following statements of support.